Once upon a time, Lou Piniella was a good manager. He took some pretty talent-threadbare Yankee teams (with guys like Butch Wynegar and Wayne Tolleneson as starters) to good records. He won a World Series with the Reds. And over a 10-year span, he managed the Mariners to 129 games over .500, including a 116-win season in 2001. But then something happened along the way in Piniella’s 22-year managerial career. 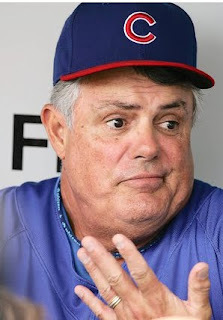 No, I’m not saying Piniella is a bad manager—he’s still a very decent manager. 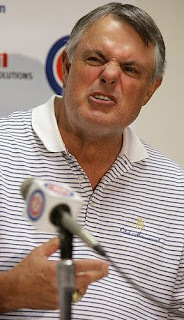 It's just that somewhere along the way, Piniella lost......it. Maybe it was the fact that he couldn't get his hometown team, the Rays, to improve, or in fact do anything. After 3 bad years, Piniella quit when he said management wouldn't give him the money he needed to get the players to win. After he quit, Joe Maddon then went and took the Rays to the World Series—with the second lowest payroll in baseball. That same year, 2008, Piniella, with a roster that cost 80 million dollars more than the Rays, got swept in the first round of the playoffs. Yes, Piniella went to the Cubs because they promised him the payroll and the players he wanted. And they delivered. But for 2 years in a row, Piniella’s Cubs gets swept in the first round of the playoffs. So Piniella, amongst a sea of other excuses, complained the loudest that the Cubs lost because they lacked a left-handed bat. So the Cubs go out and sign Mr. Personality, switch-hitting Milton Bradley to give Piniella the bat he said he lacked. And entering 2009, the Cubs had the 3rd highest payroll in the game and were picked by almost everybody to represent the NL in the World Series. They had power, speed and potential Cy Youngs—all in all, the most complete roster in the NL. A variety of things: sure they had injuries—like every team—but a lot of what went wrong could be attributed to Piniella's stubbornness. And when the stubbornness doesn't work, excuses. For instance, Piniella left Alfonso Soriano at leadoff for most of the season, despite the fact that...well, Soriano doesn't get on base—which is not good when he’s your leadoff hitter. This year, Soriano had a pathetic .303 OBP, struck out 188 times in 117 games, and stole a grand total of 9 bases. Yet Piniella kept him in the one-spot for most of the season, not trying anyone else in the leadoff spot until the season was all but over. Same thing for Milton Bradley. For far too long, Piniella left Milton Bradley in the 5-spot, even though he was batting .217 and had a harmless .311 slugging percentage. Finally Piniella shifted him around and landed him in the number 2 spot, and voila! Bradley bats .317 and bumps his slugging up .222 points. Again, though, too late in the season to be a factor. And then there's Kevin Gregg. With Kerry Wood gone, Gregg was given the closer role. Once he had it though, he starting blowing ballgames like he was a machine-driven Pez dispenser. Overall, he had 6 losses and 6 blown saves, and when he wasn’t blowing games, he was making things far too “interesting” for Cubs fans, walking batters at a rate of about 4.0/9IP. Yet he was the Cubs closer until August, when finally Piniella switched the closer role to Carlos Marmol. Why Piniella left Gregg out there in the 9th inning when everyone knew that Gregg was a time bomb is anybody's guess. Stubbornness? Maybe Pinella's stubbornness was once a asset. Maybe it was how he was able to succeed in the MLB in a body that wasn't exactly Olympic material. It was probably that stubbornness that allowed him to succeed in high-pressured New York and will lesser teams to success. But that was then and this is now. And now, Sweet Lou's stubbornness has turned into intractability and excuses. Instead of managing, Piniella now just chooses one course and sticks with past all reason. If a manager refuses to actually “manage” the game—and just do the same failing course of action over and over—then what good is he doing? And if a manager refuses to try and put the team in the best position to win the game and just follows the same course now matter the situation or repeated outcomes, then what choice do the players have, but to decide that they are leaderless, rudderless, and on their own? And if a player hears his manager say after a terrible loss to the Nationals is "Its just one game," how would the players feel? How would they react to Piniella’s comments that their losing games in San Diego and Arizona was because their parks were too big. Or that it’s too cold. Or the Cubs don’t have a good minor league system. Would they feel that there was no accountability? At all? Here’s another e xcuse, Lou. It could be the manager. It could be that the manager isn't managing. Albert Einstein’s definition of insanity is to “do the same thing over and over and expect different results.” Well, what would you call running the same failing players out there every day and hoping for the best. The old saying "The game has passed him by," is a tired cliché and often silly. However, by definition, as a cliché, it is sometimes right. And in the case with Lou Piniella, it is.